Late November means two things to me each year – Thanksgiving with family and my annual wine trip with friends to the Sierra Foothills. As was the case last year, it was a small group with my friends Eric and Russell joining me. We had an ambitious schedule planned, with five winery visits for the day – I’d made appointments at three of them but figured we would just stop in at the tasting rooms of the other two. We all met bright and early in Berkeley on the Saturday of Thanksgiving weekend, and I provided the chauffeur service for Eric and Russell from there. The weather was threatening, and we went through a couple of good downpours along the road, but by the time we got to Amador County wine country the rain had let up. We headed through the town of Plymouth and into Shenandoah Valley, the county’s main wine region. Our first visit was to a winery that is renowned for its old-vine Zinfandels, but has only recently established a presence in Amador County, home to some of California’s oldest Zin vineyards. Turley 2012 Zinfandel, “Old Vines,” California. Medium purple color, this had bright, peppery raspberry and spice aromas along with classic brambly Zin notes. Medium weight on the palate with lively acidity, finishing with some slightly rough tannins that should smooth out with some bottle age – quite a nice young Zin. Turley 2012 Zinfandel, “Judge Bell,” Amador County. Medium purple, featuring ripe and plummy fruit on the nose, along with spice and a touch of oak. Richer mouthfeel than the previous wine, with broader tannins on the finish, another promising young Zin. Turley 2012 Zinfandel, Pesenti Vineyard, Paso Robles. Medium-light garnet/purple color, with more upfront spice along with boysenberry and raspberry fruit, plus brushy and peppery notes. Medium-bodied, this had grippier tannins on the finish. Turley 2012 Zinfandel, “Cedarman,” Howell Mountain. About 90% Zinfandel and 10% Petite Sirah, from two vineyards. Medium-dark purple, this displayed a distinctively darker fruit profile than the previous wines along with spicy and savory notes and a dash of sweet oak. Moderately rich on the palate, finishing with chewy tannins. A promising young wine, though the sizable Petite Sirah component gave it less “Zin” character than the first three. Pokerville 2012 Orange Muscat, Amador County. Light yellow/gold color, with orange and spice aromas with slight floral and nutty undertones. Rich mouthfeel with a long, smooth finish – pleasant wine and an interesting take on the variety. Pokerville 2012 Barbera, Amador County. Medium purple color, this showed lots of spice along with black cherry and plum fruit and a touch of pepper. Medium-bodied with bright acidity on the palate, and a lively finish with milder tannins. Turley 2012 Cabernet Sauvignon, Napa Valley. Medium-dark color, dark berry fruit was upfront plus chocolate and spice notes. Fairly bold and rich, finishing with grippy tannins that will take some time to settle down. We had no difficulty locating our first tasting room of the day, right along the main road through Shenandoah Valley. 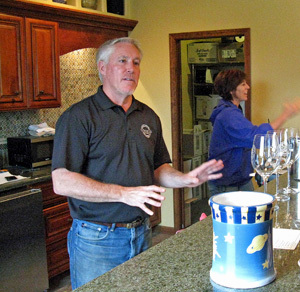 Turley Wine Cellars was established in 1993 by Larry Turley, who had previously founded Frog’s Leap Winery in the early 1980s. 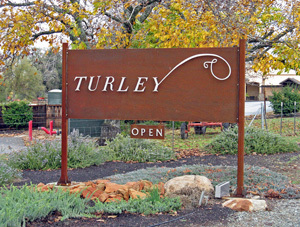 Over the years Turley became one of the top high-end Zinfandel producers in California. Specializing in small bottlings of old-vine Zin, they are one of the few non-Cabernet producers in California to have truly earned “cult wine” status. While more mainstream Zinfandels can be found easily in the $15-25 range, many of Turley’s wines are snapped up at prices of $60 or more. The winery currently releases about 38 different bottlings – most of which are single-vineyard Zinfandels – sourced from 35 widely-scattered vineyards. A number of these wines are small-production, tightly-allocated and not easily available. Turley is based at their estate property near St. Helena in Napa Valley, and they’ve had a second facility at the old Pesenti Winery near Templeton since 2000. 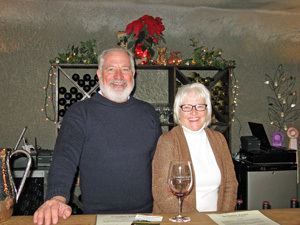 They’ve purchased some fruit from Amador County since the mid-1990s but they made a big splash on the local wine scene there in the summer of 2012 by purchasing Karly Winery, a longtime Amador producer – Karly owners Buck and Karly Cobb had decided to retire from winemaking and sell their business. The Cobbs did retain about 15 acres of vineyard, and they sell Zinfandel grapes to Turley for a vineyard-designate bottling. 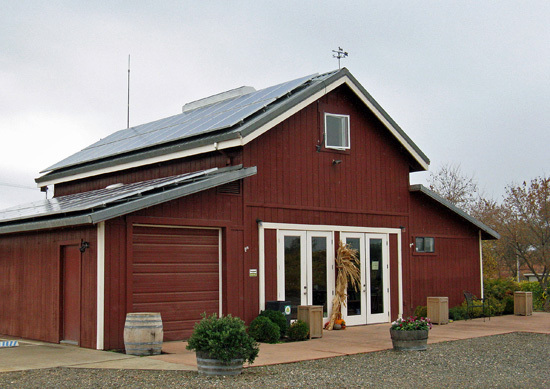 In addition to the production facility in Shenandoah Valley, which Turley is now using for their wines sourced from the Lodi and Amador regions, they gained 70 acres of property there, although less than 10 acres are currently planted to grapevines. 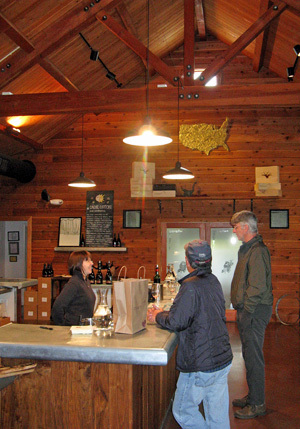 The purchase also included the tasting room – modeled on a nearby 100-year old barn, it had previously been the tasting room for the Bantam label, a sister label to Karly run by the Cobbs’ son Garth and his wife. 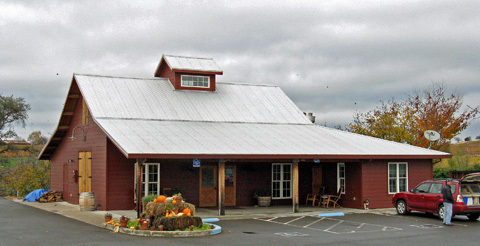 The new Turley tasting room at that spot opened in 2013. Well-known vintner Ehren Jordan had been the Turley winemaker for many years, but in recent years he found the need to spend more time on his own Failla label. Ehren ultimately decided to make the move to Failla full-time, and he passed on the Turley lead winemaking role to longtime assistant Tegan Passalacqua, who became head winemaker and vineyard manager in 2013. With the opening of Turley’s Amador facility, Nick Finarelli became their assistant winemaker there in 2013. In addition to his work with Turley, Tegan also has his own label called Sandlands. Along with other vintners such as Carlisle’s Mike Officer and Bedrock’s Morgan Twain-Peterson, Tegan has been instrumental in helping to preserve the heritage of California’s old and historic vineyards. Turley currently makes three Zinfandels from Amador fruit. The Cobb Vineyard Zin, from Buck and Karly Cobb’s vineyard, is one, and the “Judge Bell” Zin (more on that one below) is another. The third is the “Sadie Upton” Zinfandel, a longtime Karly bottling that Turley has continued. Sourced from vines planted in 1922 on granitic soil at 1,500-foot elevation near Plymouth, it was this type of vineyard that drew Turley to Amador County in the first place. It had been quite a few years since I’d last visited Turley’s tasting room at the old Pesenti facility in the Paso Robles area, so with their new Amador tasting room now open, this seemed like the perfect opportunity to try some of their latest releases. Eric, Russell, and I headed inside and we were welcomed by Laura, who was behind the large tasting bar at the center of the rustic and airy interior. We’d arrived not long after the tasting room’s 10am opening time, so we had the place to ourselves, beating the usual Thanksgiving weekend winery crowds. There were two tasting options offered – the regular tasting of four wines and the “reserve” tasting – a three-year vertical of Zins from Ueberroth Vineyard in Paso Robles. We settled on the regular tasting, which featured 2012 Zinfandels from several wine regions. First up was Turley’s “Old Vines” Zinfandel, one of their larger-production bottlings. Fruit for the “Old Vines” is sourced from vineyard sites ranging from Mendocino to Paso Robles to Amador, with vines ranging from 41 to 129 years old, with an average age of about 80 years. Next was the “Judge Bell” Zin from Amador County, sourced from Story Vineyard’s Picnic Hill block of dry-farmed and head-trained vines planted 1907. We were told that the name of the bottling refers both to the new Turley winery’s location on Bell Road and to the region’s notorious “hanging judge” of Gold Rush days. From there, we moved on to the Pesenti Vineyard Zinfandel, sourced from organically-farmed dry-farmed and head-trained vines planted in 1922 to the west of Templeton on the Central Coast. The last wine of the regular tasting was the “Cedarman” Zin – a blend from two Howell Mountain vineyards, Rattlesnake Ridge and Dragon. The 2012 “Cedarman” includes about 10% Petite Sirah from Rattlesnake Ridge, and this was evident in both the darker color and the darker aromatic profile in comparison to the first three wines. As we talked with Laura about the wines, she told us that the barrel-aging regimen for Turley’s Zinfandels has not changed for many years, with the wines aged in about 20% new oak and 80% older barrels. Laura asked whether we were interested in tasting a couple of wines from Turley’s new Amador-based second label, Pokerville. The tasting room offers a complimentary tasting of the value-priced Pokerville wines, which come from local sources. Pokerville – the Gold Rush-era name for the town of Plymouth – had been used as the name for a Karly Zin bottling. Wines under the Pokerville label currently include dry Orange Muscat, Barbera, and Zinfandel – Orange Muscat and Zin had been mainstays of Karly, and Barbera, along with Zin, is widely considered one of Amador’s signature wine varieties. We tasted the Pokerville Orange Muscat and Barbera. Orange Muscat – a grape seen few places in California outside of Amador County – is typically made as a sweet wine, but this one was quite dry, an interesting take on the variety. Laura brought out one final wine for us to taste – a 2012 Turley Napa Valley Cabernet Sauvignon. Released not long ago, this is the inaugural vintage of this wine, made from fruit sourced mostly from the estate vineyard in St. Helena. Turley’s wines have scored highly among both consumers and critics over the years, and with Tegan taking over as head winemaker they seem to be enjoying a fresh wave of attention. They buck the trend seen in recent years of wines moving toward lower alcohol levels, with many of them over 15% alcohol. For a number of reasons, Zinfandel is not the easiest variety to work with if you’re looking to make lower-alcohol wines in California, and Turley’s wines – always noted for being big and bold – don’t try to hide Zin’s natural exuberance. Yet the wines we tasted never came close to seeming over-ripe, with very fine balance across the board. A big plus to visiting the Turley tasting room is the availability there of some small-production bottlings that are otherwise hard to get – the “Sadie Upton” Zin was one example. And wine prices there are very good too – the “Old Vines” bottling, at less than $30 at the tasting room, is good value for a wine of this pedigree and quality. The other three Zins we tasted were all very tasty as well, and distinctive of the regions in which their fruit was grown. If you’re a Zinfandel fan, stopping at the Turley tasting room in Amador’s Shenandoah Valley is a must. Vino Noceto 2013 Pinot Grigio, Clarksburg. Made entirely in stainless steel. Very light straw color, with stone fruit and slightly floral aromas. Fairly light-bodied with moderate acidity, this had a long, fresh finish – not especially complex but quite pleasant. Vino Noceto 2011 Sangiovese, “Noceto,” Amador County. Light garnet color, featuring bright red fruit, herbs, and a touch of earth on the nose. Medium-light bodied with a lively texture and mild tannins, a good “everyday” Sangiovese. Vino Noceto 2011 Sangiovese, “Hillside,” Shenandoah Valley. Medium-light color, this showed more intense aromatics, with cherry, smoke, and herbs upfront and a touch of sweet oak in the background. Medium weight with a bright mouthfeel and more structure than the previous wine, this finished with moderately grippy tannins, nice now and should improve with more bottle age. Vino Noceto 2011 Sangiovese, “Misto,” Shenandoah Valley. Field blend of about 90% red varieties (Sangiovese plus a little Canaiolo Nero) and 10% whites (Malvasia and Trebbiano). Slightly darker color, showing more herbal character on the nose along with red fruits and earth. Medium-bodied with a smoother texture and broader tannins than the previous wine. Vino Noceto 2011 Sangiovese, “Marmellata,” Shenandoah Valley. Medium-light garnet/purple color, showing riper, spicier, and darker fruit than the previous two wines. Bold but bright mouthfeel with a more viscous texture and moderate tannins on the finish. Vino Noceto 2011 Sangiovese, “Dos Oakies,” Shenandoah Valley. Medium-light color, this had a more savory character along with black cherry and darker fruit, spice, and earth. Slightly richer on the palate than the previous wine, finishing with broad, chalky tannins, nice. Vino Noceto 2011 Barbera, “Linsteadt,” Shenandoah Valley. Medium-light color, displaying bright cherry fruit plus herbs and a touch of vanilla/oak. Medium weight with juicy acidity and moderate tannins, nice example of Amador Barbera. Vino Noceto 2010 Zinfandel, “OGP – The Original Grandpère Vineyard,” Amador County. Medium purple color, with intense and ripe raspberry and darker fruit aromas along with notes of earth and sweet oak. Medium-bodied with a fairly smooth texture, finishing with moderate tannins and a touch of sweetness. Vino Noceto 2013 “Frivolo,” California. 80% Moscato Bianco, 20% Orange Muscat, frizzante-style, with 7% alcohol and 7% residual sugar. Light straw color, with mildly perfumey floral aromas along with stone fruit and tropical fruit notes. Fairly rich and lightly fizzy, this had a long smooth finish – distinctive and very tasty. We left Turley, and our next stop was just a minute or two up the road, at Vino Noceto. I’d visited the winery several times in the past, but it had been a number of years since my last stop there. Their tasting room is open regularly, but I’d made an appointment with Gregg Lamer, Vino Noceto’s sales & marketing director. 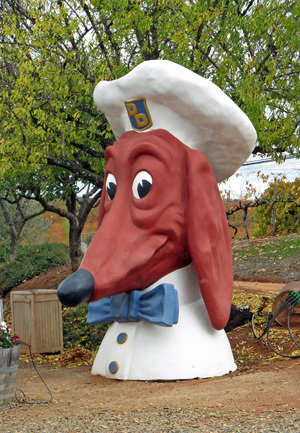 We arrived just as a light drizzle had started, but I managed to take a couple of photos before heading into the tasting room, including a shot of the winery’s Doggie Diner head at the edge of their vineyard. Those who grew up in San Francisco and the East Bay will remember the small (and now long-gone) local chain of Doggie Diner restaurants and their memorable dachshund head signage, complete with bow tie and chef’s hat – a few of those remain and this is one, in perhaps the most surprising location of any of them. 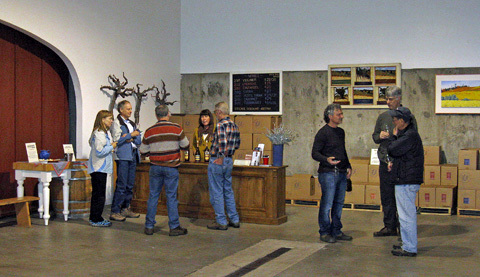 Inside the tasting room, we quickly located Gregg at a side tasting area that’s been added to the main space recently. Gregg had previously worked for Mondavi, Renwood, and Domaine Carneros among others and founded the Amador 360 Winery Collective & Tasting Room in Plymouth. He helped start a new Wine & Food Tasting program at Vino Noceto earlier in 2014, featuring wines paired with small bites created by Chef Beth Sogaard of Plymouth’s Amador Vintage Market. The beautiful tasting bar in this area was created using reclaimed oak from old upright tanks at Montevina Winery (now Terra d'Oro) and tin from one of the barns at the old D’Agostini winery and vineyard (the old winery is now part of Sobon), two of Amador’s most historic wineries. 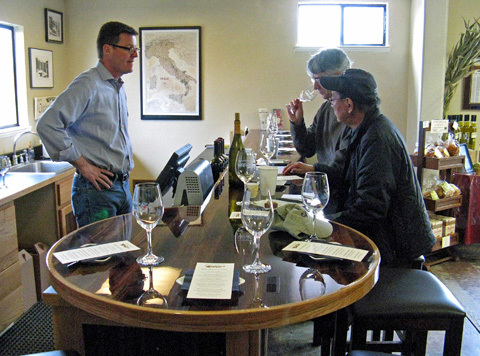 As we were settling in at the barstools, Vino Noceto owner Jim Gullett came by briefly and said hello – he and his wife Suzy established the winery in the mid-1980s. They both grew up in the Bay Area and met while working on banking systems for Bank of America. 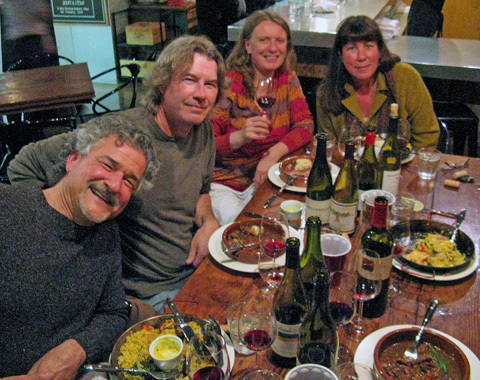 Probably California’s best-known Sangiovese specialist, Vino Noceto started as a number of California wineries do – with the owners catching the “wine bug” after years of wine-country visits and then buying property for a vineyard in a beautiful wine region, in this case Amador’s Shenandoah Valley. 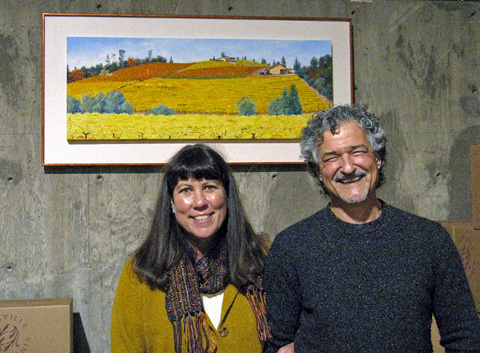 Despite the area being known mainly for its Zinfandel, Jim and Suzy decided to follow their love of Sangiovese-based wines and make that the focus of their efforts. Before planting their new vineyard site, they sought out the advice of famed Sacramento wine expert Darrell Corti and traveled to Tuscany to learn about vineyard and winemaking practices at noted Chianti and Brunello producers such as Castello dei Rampolla, Argiano, Isole e Olena, and Badia a Passignano. Early vintages of Vino Noceto wines were made by winemaker Scott Harvey at other facilities. Their own winery was completed in 1999, and since then Rusty Folena has taken over the winemaking duties with Stacey Gregersen as their consulting winemaker. Annual production is around 10,000 cases, about half of which is their flagship “Noceto” Sangiovese, around 2,000 cases of their light, frizzante-style “Frivolo” Moscato, and the rest being smaller-production bottlings of Sangiovese and a few other wines. 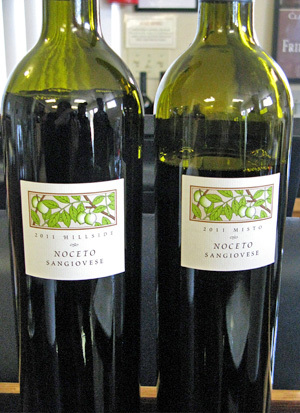 Noceto, which means “walnut grove” in Italian, was a natural choice for the winery name. There had been a grove of the trees at the vineyard site (some still remain), and the small city of Noceto in Italy is the sister city of Suzy’s hometown of Walnut Creek. And not least, more than a few people thought that Jim and Suzy were “nuts” for planting so much Sangiovese in Zinfandel Country! Vino Noceto is now celebrating 25 harvests from their estate vineyard. Jim and Suzy purchased 21 acres in Shenandoah Valley in 1984, and after adding an adjacent 18.5-acre site to their property in 1987, they began planting the vineyard the following year – it’s currently up to about 25 acres in size. Nearly all of the vineyard is planted to Sangiovese, with five different clones, plus a few varieties used for blending into their “Misto” Sangiovese bottling, inspired by Chianti Classico. Specific clones are planted separately in different vineyard blocks. Jim and Suzy were able to obtain vine cuttings that originated from some renowned sources in Tuscany, including Isole e Olena, Il Poggione, Biondi Santi, and Altesino. 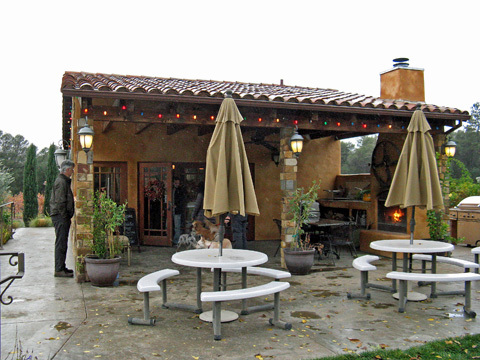 Vino Noceto also purchases Sangiovese fruit from nearby Reward Ranch (owned by the family of Kendric Vineyard’s Stewart Johnson), which has sometimes been made into a vineyard-designate bottling in the past. Gregg started out our tasting with a very nice Pinot Grigio, from fruit grown in the Clarksburg region of the Sacramento Delta, the source of more and more crisp and tasty whites in recent years. I’m not usually a big fan of Pinot Grigio but this one, made entirely in stainless steel, was quite appealing. As we continued our tasting through five of the winery’s six Sangiovese bottlings, Gregg discussed Vino Noceto’s Sangiovese winemaking procedures with us. Sangioveses are fermented in up to 20 lots each year from various vineyard blocks and clones. Fermentation for most lots takes place in temperature-controlled stainless steel tanks, with the goal of preserving the variety’s aromatics. A few other lots are fermented in French oak puncheons, a more laborious process. Nearly all the Sangioveses are aged in puncheons (10-25% new) for at least one year (and up to three years) and then bottle-aged for up to 18 months prior to release, longer than at many other wineries. The clonal difference in the wines was striking – the two Chianti clone bottlings were lighter and more delicate compared with the bolder and darker-fruited Brunello clone pair. The “Misto” is unique in the winery’s line-up in that it aims at a more traditional Chianti-style blend rather than being 100% varietal Sangiovese. It’s a field blend of about 90% red grapes (Sangiovese plus a little Canaiolo Nero) along with 10% white grapes (Malvasia and Trebbiano). 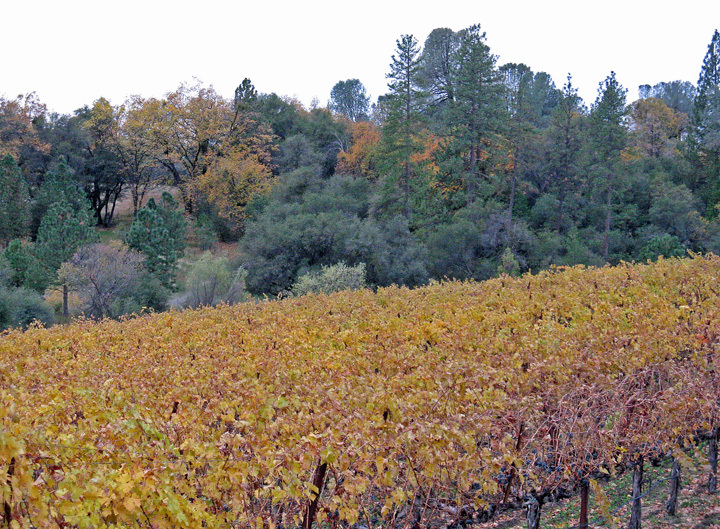 The Dos Oakies block is the vineyard’s initial 1987 planting – the name comes from two prominent oak trees there, though only one of them now remains. Vino Noceto currently produces six Sangiovese bottlings (there’s a “Riserva” that we didn’t taste), and there’s a seventh one on the way. Called “AX1” (“Altesino Experiment 1,” named for the vines’ origin), the inaugural 2009 vintage will be released soon. This is intended to be a darker, more full-bodied, and more structured wine than the winery’s other Sangioveses, and it will become their top of the line offering in terms of price as well. 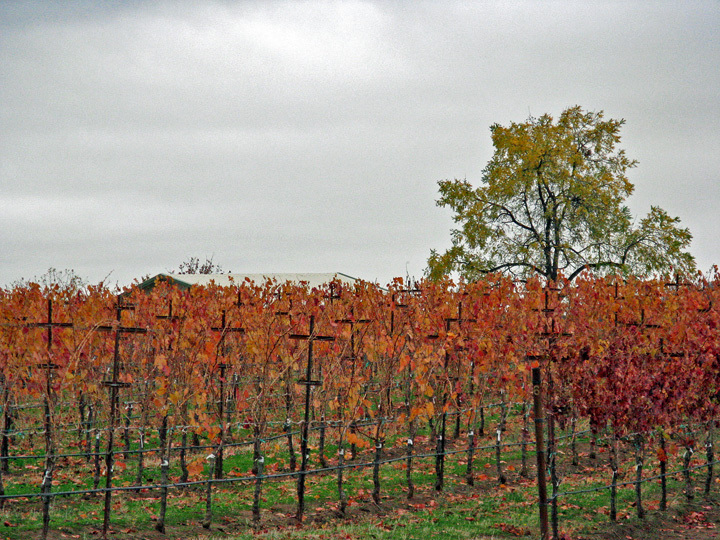 Vino Noceto has long been a leader in making Sangiovese in California. It’s no secret that Italian varieties from California are not the easiest to sell, and since they’ve started up, other vintners have tried and failed with the variety, but Vino Noceto has kept with it. They’ve remained true to Sangiovese’s roots in Chianti and Brunello rather than try to force a big Cab-like character out of it, as some others have done. Vino Noceto’s Sangioveses don’t try to hide their natural lighter color and body, and their fine acidity makes them the easy match with food that Jim and Suzy Gullett have always aimed for. Vino Noceto has also done well at recognizing the distinctions that clonal differences and various vineyard blocks can have on the wines – all five of the Sangiovese bottlings we tasted were all quite distinct from one another. Gregg was a fine host for our tasting, affable and very knowledgeable about the Vino Noceto wines and about Amador vineyards and wineries in general. The Wine & Food tasting was a great option – the food pairings that we had during our tasting with Gregg worked very well to accentuate the character of the wines without competing with them. I liked all of the Sangioveses we tasted, with the “Hillside” and “Dos Oakies” being my favorites, and I thought the Pinot Grigio and Barbera were also very good. Vino Noceto continues to be a great place to stop in Shenandoah Valley, with a line-up of rewarding wines. When we initially planned our wine trip, we’d hoped that we could enjoy a picnic lunch at one of the wineries, but the weather did not cooperate. After checking out possible lunch options on the web, it looked like Katie’s Country Café & Bakery might be a good choice. Located along the main road in the tiny community of Mount Aukum, just north of the Amador County border in El Dorado County, it’s only a short distance from where we needed to turn off to our next winery destination. We arrived at the café shortly after noon, which was a good thing, as the place got quite busy while we were there. There aren’t a lot of options for places to eat between Plymouth and the Fair Play area, and Katie’s turned out to be just fine – nothing fancy but a pleasant and tasty lunch. HorsePlay 2012 White Blend, Amador County. Mostly Roussanne with some Viognier and Muscat. Light straw color, with stone fruit, floral, and herbal aromas. Medium-light bodied with lively acidity and a fresh finish – nice wine and great value too. Morse 2012 Viognier, Estate, Amador County. Very light straw color, this had a more pronounced floral character along with stone fruit and citrus notes. Medium-bodied with a fairly smooth texture and finish. Morse 2012 Mourvèdre Rosé, Estate, Amador County. Light pink color, this displayed earthy red fruit on the nose. Medium-light weight with moderate acidity and a touch of heat on the finish. Il Gioiello 2010 Sangiovese, Estate, Amador County. Medium-light color, showing black cherry fruit with spicy oak undertones. Medium-light weight on the palate, finishing with moderate tannins. Il Gioiello 2011 Barbera, Amador County. Medium garnet/purple color with brighter red fruit, spice, and earth on the nose. Medium-bodied with a lively texture and fairly mild tannins on the finish. Il Gioiello 2012 Barbera, “Reserve,” Estate, Amador County. Sourced from a rocky vineyard block higher up the hill. Darker purple than the previous wine, featuring more primary fruit aromas along with a bigger spice component. A bit richer in the mouth, finishing with grippier tannins. Il Gioiello 2011 “Triumphe,” Amador County. 62% Brunello clone Sangiovese, 27% Cabernet Franc, 7% Merlot, 2% Aglianico. Medium-light purple, this had upfront black cherry and plum aromas, plus herbs, earth, and spicy oak. Medium-bodied with good acidity and bigger but refined tannins – this could use time in the cellar but shows promise. Il Gioiello 2011 Montepulciano, Estate, Amador County. Medium purple, with bold plummy fruit along with spice, earth, and a touch of pepper. Moderately rich mouthfeel with grippy tannins. Il Gioiello 2008 Cabernet Sauvignon, Amador County. 75% Cabernet Sauvignon, 24% Cabernet Franc, 1% Petite Sirah. Medium purple color, showing bright plum and darker berry fruit, herbs, and undertones of sweet oak. Lighter-style Cabernet on the palate, but with big, chewy tannins on the finish. Il Gioiello 2012 Zinfandel, Amador County. Medium purple, this featured lots of spice upfront, backed by darker berry fruit along with some earthy notes. Medium-bodied with bright acidity, this finished with medium tannins. Morse 2009 “Three Popes,” Amador County. 55% Grenache, 29% Mourvèdre, 16% Syrah. Medium-light purple, with plenty of spice along with red fruits, earth, and a touch of pepper. Medium weight with a fairly lively texture and grippy tannic finish. Morse 2009 Mourvèdre, Estate, Amador County. 92% Mourvèdre, 8% Syrah. Medium purple, displaying earthy black cherry and plum, spice, and a savory component on the nose. Medium-bodied with good structure and moderate tannins, nice. Morse 2009 Syrah, Estate, Amador County. From Estrella and 877 clones. Medium purple color, with darker berry fruit, smoked meat, and spice aromas. Medium weight with a slightly richer mouthfeel, finishing with chewy tannins – a promising wine that could use some time in the cellar. Morse 2009 Petite Sirah, Estate, Amador County. Medium color, this showed blackberry, flowers, and earth on the nose. Medium-full bodied with a very grippy tannic finish. Morse 2012 Muscat Blanc, El Dorado County. 2.5% residual sugar. Very light color, featuring bright perfumey floral Muscat aromas. Medium-bodied with a moderately rich texture and sweet finish. We only had to backtrack about a quarter-mile to turn off the main road toward our first winery visit of the afternoon, at Morse Wines / Il Gioiello Winery. We traveled south, back into Amador County along a small back road between Mount Aukum and Fiddletown. None of us had ever been to the winery before, so it was fortunate that there were good signs at key turns along the route, which helped greatly in finding our way. After proceeding through the winery gate and parking the car, we walked up to the Tuscan-inspired tasting room building, passing a couple of damp-looking bocce courts on the way. The winery itself is located just up the hill. We were greeted outside the tasting room door by one of the playful winery dogs – we learned that they consider themselves one of the most dog-friendly wineries in the area for visitors traveling with their canine companions. The small tasting room was crowded, as we found that this was wine pickup weekend for their wine club members, but we squeezed into a spot at the end of the tasting bar, where owner/winemaker Rob Morse was busy pouring his wines. Rob had worked in the high-tech field, where he’d developed a taste for great wine while traveling for his work. He told us that he also loves to cook, so he’s always favored food-friendly wines. The origins of the winery go back to 1999, when Rob purchased his 80-acre property near the northern edge of Amador County. It certainly can be considered off the beaten path – neither in northern Amador’s main growing areas around Shenandoah Valley and Fiddletown nor in the cluster of wineries and vineyards in southern El Dorado’s Fair Play region. The estate vineyard was planted mostly in 2000-2001, and includes over a dozen grape varieties, mostly of Rhône Valley and Italian origin, as Rob felt that these are particularly versatile with food. The site is at around 2,300-foot elevation, with 20 acres currently planted, mostly on decomposed granite soil as well as volcanic shale and schist – Rob told us that he really likes the fruit he gets from the vines planted on schist. The first wine made from estate fruit was a 2003 Petite Sirah. Rob’s wines were initially all produced under the Il Gioiello label – the name means “little jewel” in Italian. Rob joked that everyone told him he was crazy to come up with a name that few people could either spell or pronounce (“eel joy-yellow”). Since 2006, Rob’s Rhône-style wines have come out under the Morse label, while Italian varieties, Cabernet, Zinfandel, and the winery’s “Super Tuscan”-style blend remain under the Il Gioiello label. A third label called Parallax is for value-priced bottlings, while a newer addition to the wine family is the HorsePlay line. With a red and white blend, HorsePlay aims to raise funds for the Return to Freedom wild horse sanctuary in Lompoc. The HorsePlay label art is from a painting by artist Donna Bernstein. Total current production for all the labels is about 4,500 cases per year. Rob kept his day-job for a number of years after launching his winery, and he hired a winemaker to oversee the production during that time. But he eventually moved to the property full-time and devoted himself to the vineyard and winery, and he’s headed up the winemaking since then. He told us that the fruit is hand-sorted three times as it’s processed. He also said he’s a fan of the Heinrich barrels that are made from tight-grain Missouri oak, air-dried and coopered in Australia, and then shipped back to the US. I’d wanted to visit here since I was curious about all the Italian grape varieties that the winery produces – I’d tried a few of the wines at an event in the Bay Area about four years earlier and recall particularly enjoying their Montepulciano at that time. On this occasion, we tasted through 15 HorsePlay, Morse, and Il Gioiello wines with Rob, who had his hands full with the busy tasting room that afternoon. The HorsePlay White Blend was quite a fine lighter-weight white and a steal for the price. The winery’s flagship wine is the Il Gioiello “Triumphe” – a Super Tuscan blend of Italian and Bordeaux varieties, this one is built for aging. The Morse Rhône-style reds showed well, particularly the Mourvèdre, and we finished with a floral and sweet Muscat. Among the wines that we didn’t taste on our visit are Aglianico, Cabernet Franc, and “Ensemble” red Rhône-style blend. We had a good time visiting Morse / Il Gioiello and talking with Rob, and the busy tasting room testified to the popularity of these wines. As with Vino Noceto, focusing on Italian grape varieties is not an easy direction for a California winery to take, although Morse / Il Gioiello produces plenty of other wines for those who have different preferences. Overall I thought the wines were good though not especially noteworthy, with the HorsePlay White Blend and Mourvèdre being my favorites of the bunch and a couple of others – the “Triumphe” and Syrah – showing promise for the future. Best of all, the prices are very reasonable, with most wines we tasted ranging from $18-22 and none over $30. 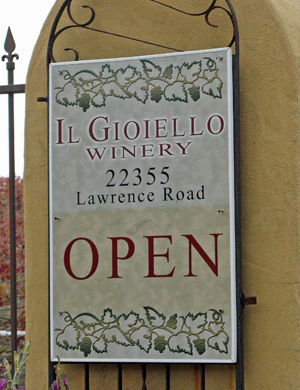 It takes a bit more effort to get to this winery than most others in Amador, but if you’re feeling a little adventurous – taking some scenic backroads and trying some varieties you won’t find at most other local tasting rooms – than a visit to Morse / Il Gioiello might be just the ticket. Gwinllan 2012 Dry Riesling, Estate, Fair Play. Light straw color, with stone fruit and citrus notes along with a distinct petrol component. Medium-light weight with a viscous texture and a hint of bitterness on the finish. Gwinllan 2011 Chardonnay, Estate, Fair Play. Light color, this featured apple and stone fruit, earth, spice, and a touch of sweet oak. Medium-bodied with a fairly smooth texture and finish. Gwinllan 2010 Zinfandel, Estate, Fair Play. Medium-light purple, showing brambly dark fruit, spice, and an overlay of vanilla/oak. Medium-bodied with good acidity and a firm tannic finish. Gwinllan 2010 “Winemaker’s Selection,” Estate, Fair Play. 55% Grenache, 23% Syrah, 22% Mourvèdre. Medium-light purple, with plummy fruit and spice upfront, along with earth and vanilla/oak notes. Moderately rich mouthfeel, finishing with grippy tannins. Gwinllan 2010 Cabernet Sauvignon, Estate, Fair Play. Medium-dark color, this displayed a darker fruit profile plus spice, herbs, and mocha. Richer texture on the palate, with big but fine tannins on the finish. Gwinllan 2010 Petite Sirah, Estate, Fair Play. Dark purple, smoky and savory dark fruit on the nose, along with earth and vanilla/oak. Full-bodied but lively, this finished with big, chewy tannins – needs time but a promising young Petite Sirah. Gwinllan 2012 “Teulu,” Estate, Fair Play. 75% Malbec, 25% Cabernet Sauvignon, not yet released. Dark color, with smoky, earthy boysenberry, herb, and spice aromas. Medium-full bodied with great structure and grippy tannic finish – quite promising but this will need plenty of time in the cellar. Gwinllan 2012 Muscat Canelli, Estate, Fair Play. 0.75% residual sugar. Very light straw color, featuring aromas of ripe pear and stone fruit with floral undertones. Medium-bodied and lightly sweet, with good balancing acidity and a long, tasty finish, nice. There was a light rain coming down when we came out of the Morse / Il Gioiello tasting room, so we dashed back to the car and headed back toward Mount Aukum. We continued north along the main road for several miles, past one of several alpaca ranches in the area (the alpacas didn’t seem to mind the rain too much), and turned east onto Fair Play Road. It wasn’t long before we spotted a sign directing us to our next destination, Gwinllan Estate Winery. After a drive past a couple of other vineyards and up a prominent knoll, we arrived at the tasting room. Gwinllan is one of the area’s newest producers, opening their tasting room in 2013. I had not heard of them until recently, when Jonathan Lachs of Cedarville Vineyard had suggested stopping there for a visit. Gwinllan is very much a family affair, run by Gordon Pack and his wife Chris, along with their son Jonathan. 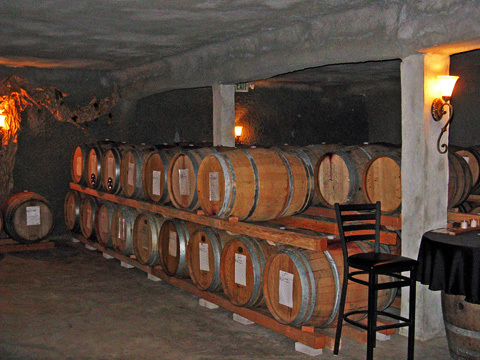 The Gwinllan tasting room is located inside their hillside wine cave. The entry is not the most attractive in comparison with most winery tasting rooms, but it’s functional. The winery itself is located nearby, behind the Packs’ house. Even in the damp weather, the view from the front of the tasting room was beautiful, looking out across the hills of the Fair Play appellation. We stepped into the tasting room, where Gordon and Chris welcomed us. Chris was just on her way out with one of their three Border Collies – they provide “chemical free vineyard vermin control” according to the Gwinllan website. The Packs are originally from Britain, with family from Blaengwynfi in Wales and Bedford in England – “gwinllan” is the Welsh word for vineyard. In the 1980s, Gordon had tried his hand at home winemaking in England, from grapes grown in a greenhouse (Gordon was never able to determine what variety they were), as the vines were not able to survive the cold and wind at their location. The Packs relocated to the US over 20 years ago for Gordon’s engineering work, coming to live in the San Francisco Bay Area after a couple of earlier stops. Gordon eventually decided to give grapegrowing and winemaking another try. Because Zin had become a particular interest, he attended one of the large ZAP Zinfandel tastings in San Francisco, looking for wines he liked with a goal of finding a good location to plant the variety in California. It turned out that his two favorite wines at that tasting were both made by Napa Valley wineries but both made from El Dorado fruit – his direction was now clear! Gordon and Chris bought their property in 2005 and planted it the following year. It’s located in El Dorado County’s Fair Play AVA, which boasts the highest average elevation of any appellation in California. The 80-acre site currently has 18 acres planted with four whites and eight reds: Chardonnay, Viognier, Riesling, Muscat, Grenache, Mourvèdre, Syrah, Petite Sirah, Zinfandel, Cabernet Sauvignon, Cabernet Franc, and Malbec. The vineyard is on a hillside at about 2,300-foot elevation, with the white varieties planted on the cooler north-facing slope. The soil is mostly decomposed granite, about four to eight feet deep. The first harvest from the vineyard was in 2009. All of the Gwinllan wines are made entirely from estate fruit, and the Packs also sell fruit to other wineries. 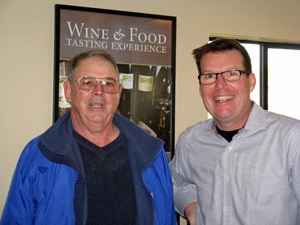 Gordon is the Gwinllan winemaker, but his son Jonathan plays a key role as well. Jonathan earned a degree in viticulture and enology from UC Davis in 2007, and acts as Gwinllan’s viticulturist and consulting winemaker. Deficit irrigation is used to help control yields and produce more intense fruit, and to encourage the young vines’ root systems to grow deeper into the soil and rock as the vines mature. We started our tasting with a Dry Riesling, which had a light but unmistakable petrol aroma that’s characteristic of the variety. Next up was Chardonnay, fermented in stainless steel tanks and then barrel-aged for six months in about 33% new French oak. Gordon told us that American oak is used for aging the Gwinllan Zinfandel and Petite Sirah, while all the other wines are aged in French oak. The distinctive American oak component came through in the Zin in particular. The “Winemaker’s Selection” is a Rhône-style Grenache-based GSM blend – the percentages of each variety in the blend changes from year to year. Chris returned partway through our tasting and joined us for the rest of it. Our next wine was Cabernet Sauvignon, and Gordon told us that they do multiple picks in the vineyard for that fruit, working to increase the complexity of the wine by picking at several levels of ripeness. After a dark and smoky Petite Sirah, Gordon gave us a taste of a wine that won’t be released until next spring – a very intriguing Malbec-based wine called “Teulu” (Welsh for “family”). We finished up with a Muscat Canelli – a nice rendition that was not overly sweet. In addition to these wines, Gwinllan also makes a Zinfandel Port that we didn’t taste. We really had a fun time visiting with Gordon and Chris at Gwinllan – it didn’t take long for them to make us feel right at home. The wines were solid across the board, with my favorites being the Petite Sirah, Muscat, and the upcoming “Teulu” blend. Prices tend to be a touch higher than most other Sierra Foothills producers, though the wines are still good value in comparison to most of similar quality in California. It’s cool to see someone working with varieties not often seen in this growing region, such as Riesling and Malbec – and you won’t even find that many Chardonnays in the area. Gwinllan was an unexpected and pleasant discovery for me, and being right along the main road through the Fair Play appellation makes their tasting room an easy place to stop in for a visit – well worth checking out. Cedarville 2013 Viognier, Estate, El Dorado. 100% Viognier. Light straw color, showing ripe stone fruit with hints of tropical fruit, spice, and sweet oak. A stony mineral component came out on the palate, and the finish was lively and clean, nice. Cedarville 2012 Grenache, Estate, El Dorado. 86% Grenache, 14% Syrah – half of the Syrah was co-fermented with the Grenache. Medium-light garnet/purple, with bright red fruits, herbs, earth, and vanilla/oak in the background. Medium-light bodied with good acidity and chalky tannins – promising, but needs some time in the cellar. Cedarville 2012 Zinfandel, Estate, El Dorado. 94% Zinfandel, 6% Petite Sirah. Medium purple color, with upfront ripe and brambly raspberry fruit, plus a pencilly oak note. Medium weight in the mouth, with good structure and moderate tannins. Cedarville 2012 Syrah, Estate, El Dorado. 96% Syrah, 4% co-fermented Viognier. Medium-dark purple, displaying blackberry fruit, spice, and touches of smoke and mocha. Medium-bodied with a lively texture and firm tannins. Cedarville 2012 Petite Sirah, El Dorado. 100% Petite Sirah. Very dark color, this featured floral notes along with dark berry fruit, chocolate, and touches of pepper and spice. Fairly rich yet structured, with big but refined tannins on the finish – nice already but deserves more bottle age. Cedarville 2010 Cabernet Sauvignon, Estate, El Dorado. 100% Cabernet Sauvignon. Dark purple, with herbs and plums leading the way along with spice and sweet oak in support. Full-bodied and structured for aging, finishing with big, broad tannins. Cedarville 2011 “Turnabout’s Fair Play,” Estate, El Dorado. 45% Grenache, 30% Syrah, 25% Cabernet Sauvignon. Medium color, this showed bright red fruit, dried herbs, spice, and a stony mineral note on the nose. Medium-bodied with good structure and chalky tannins on the finish – another promising youngster that should improve with time in the cellar. As is often the case, we made the final stop of our day of Sierra Foothills wine touring at Cedarville Vineyard. It was just a short drive from Gwinllan and we arrived a little earlier than planned, so Jonathan Lachs and Susan Marks, the husband-and-wife owner / winemaker team, were still pouring their wines for a few other guests at the modest tasting counter in a corner of the winery. But as we were not in any big hurry, we took the time to snap a few photos, and Jonathan talked with us while Susan continued with the tasting for the other group. I’d met Jonathan and Susan in 2000 when they were pouring their wines at the Hospice du Rhône wine event in Paso Robles. I liked their wines and made a point of visiting them the next time I visited the Sierra Foothills wine region, and I’ve followed them ever since. Located in the heart of the Fair Play AVA, Cedarville is situated on a hillside at about 2,500-foot elevation. Jonathan and Susan met while they were earning enology degrees at UC Davis, but they both worked for a number of years in Silicon Valley before purchasing their vineyard site in 1995. They began planting the same year and released their first wines from the 1998 vintage. 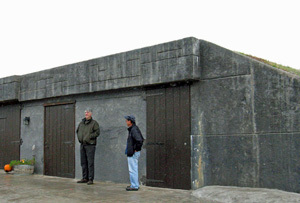 By 2000, they had completed their winery building that includes two concrete barrel rooms extending into the hillside, providing natural cooling. They’ve farmed their 15-acre vineyard organically since 2010 – it’s planted to Viognier, Grenache, Mourvèdre, Syrah, Zinfandel, and Cabernet Sauvignon. The decomposed granite soil at their site is characteristic of the area but uncommon in most other California wine regions. Jonathan told me that the years of composting in the vineyard and decent rainfall this past spring had been very beneficial for the vines this year. He noted that the soil’s moisture holding capacity seemed to be better this year, helping to reduce the need for irrigation during the growing season. They were able to reduce irrigation by 70% in 2014 compared with 2013 – good to be able to reduce water usage during these dry years in California! Jonathan added that the vines did fine this year even with much less irrigation, and since he noticed no negative effect on fruit quality, he’s hoping that they can keep the irrigation to a minimum again next year. A big benefit of having their own vineyard directly adjacent to their winery is that Jonathan and Susan can bring in their fruit as soon as it’s picked. It’s a small, hands-on operation, and the pair do nearly all of the work there themselves. Fruit is sorted, destemmed, and fermented in small lots, with a large percentage of whole berries. Some fermentations are done in temperature-controlled stainless steel tanks while others are done in ½-ton macrobins (Syrah, Grenache, and sometimes a small lot of Zin or Petite Sirah). The wines are aged in French oak barriques. The Cedarville wine line-up has remained quite steady over the years, with varietal bottlings of all of the grapes grown in their vineyard with the exception of Mourvèdre, which they sell to other producers. 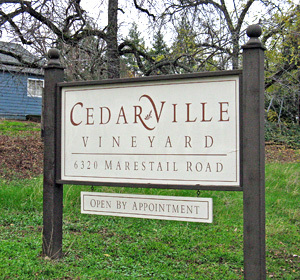 The only non-estate Cedarville wine is Petite Sirah from nearby Naylor Vineyard. A recent addition to these bottlings is “Turnabout's Fair Play,” a Grenache/Syrah/Cabernet blend that’s inspired by the wines of Priorat. We started our tasting with the Viognier – the new 2013 release seemed a touch riper than a couple of their recent vintages, giving it a bit more in terms of aromatics and body, while retaining the acidity and minerality that have become hallmarks. The 2012 Grenache, Zinfandel, and Syrah were all very good – probably more user-friendly right out of the gate than the leaner 2011s had been at this stage. There was no Petite Sirah in 2011 due to the cool growing conditions not allowing the fruit to ripen sufficiently, but it’s back with the 2012 vintage release. Sourced from vines planted in 1977, this might be Cedarville’s best Petite Sirah yet. Cedarville’s Cabernet is one of the best from the Sierra Foothills, always beautifully balanced and age-worthy. We finished our tasting with the 2011 “Turnabout's Fair Play,” another wine that displayed Cedarville’s characteristic minerality well and should age nicely. Over the years, I’ve noticed that Cedarville wines can show a fair amount of oak when young, but it almost invariably integrates well with even a couple of years of bottle age – that’s not an easy trick to pull off but it shows what a deft touch Jonathan and Susan have with their winemaking. Favorites among the new wines we tasted included the Viognier, Grenache, Petite Sirah, and “Turnabout’s Fair Play.” As with most of Cedarville’s wines, all of these will really benefit from some bottle age, including their Viognier – one of the few in California that has developed a track record of aging gracefully. Visiting Jonathan and Susan at Cedarville has become an annual tradition for me. Their wines are consistently among the best in the Sierra Foothills, and they’re great hosts, friendly and fun to talk with – Jonathan’s always up for a discussion about the San Jose Sharks! They’re always happy to offer suggestions on places to eat in the area as well as other local wineries to visit. The Cedarville name comes from a nearby Gold Rush-era ghost town that, like many towns of that period, thrived for a few years and then faded away. Jonathan and Susan felt connected to the pioneer spirit of those earlier settlers, but they’ve already proven to have more staying power. If you’re visiting wineries in the Fair Play wine region, I highly recommend making an appointment at Cedarville. We’d enjoyed dinner last year at Allez! in Diamond Springs, just outside of Placerville, and decided to return there this year. It’s a tiny place run by Christian and Jennifer Masse, who had previously owned nearby Zachary Jacques Restaurant. Jonathan and Susan from Cedarville were able to join us for dinner, and they invited Hank Beckmeyer and Caroline Hoel of La Clarine Farm, whom a group of us had visited in 2012. Eric, Russell, and I headed to the restaurant first to try to snag their one large table, and we were fortunate to have done so as the place filled up quickly. Everyone else arrived shortly afterwards, and we had another great meal at Allez! along with plenty of fine wines that we’d brought to open there and enjoyable company too. Although we were having a good time enjoying our wines after dinner, Eric, Russell, and I needed to start the long drive back to the Bay Area, so we said goodbye to everyone and hit the road. We had dry weather on our trip home, and it was a smooth drive all the way. Each time I visit wineries in the Sierra Foothills, I find new ones that are helping to raise the bar for quality there. Being in a region that’s a bit removed from the main wine centers of California has always affected the ability of Foothills growers and producers to attract top-level talent, so progress has been slow but it’s been unmistakable. Solid producers such as Sierra Vista, Easton / Terre Rouge, and Vino Noceto have been around for years, and they’ve been joined over time by others like Cedarville, Holly’s Hill, Skinner, and more. Gwinllan and other newer producers are clearly focused on pushing the quality level forward as well. And with the growing fame of Amador’s Shake Ridge Ranch vineyard (whose fruit goes into some high-priced Napa bottlings among others), the dedicated following of slightly offbeat producers such as La Clarine Farm and Clos Saron, and now adding the move of Napa Valley’s Turley into the mix, a real critical mass of interesting and high-quality growers and producers in the area may finally be forming. How all of this will ultimately affect the charming character of these off-the-beaten-path wine regions remains to be seen. For now, visiting Amador and El Dorado County wineries is a little like taking a step back in time – you’re very likely to meet the winery owner or winemaker behind their tasting bar, and most wine prices are well below what you’d pay for similar-quality wines from areas like Napa or Sonoma. I always enjoy visiting the Sierra Foothills wine country and look forward to heading back there soon. As always, thanks to everyone that we visited for being so generous with their time and their wine!